It’s been 238 years since the founding fathers declared independence from Great Britain and formed a country of 13 colonies. You know that, of course. But it’s been a while since history class. So here’s a quick-hit history lesson on the holiday. We should be celebrating on July 2. Representatives of the 13 colonies, called the Second Continental Congress, actually voted on July 2, 1776, in Philadelphia to declare independence. John Adams believed that day would be marked with celebrations throughout the nation’s history. But it wasn’t until two days later that a congressional committee approved the final draft. And it wasn’t until Aug. 2 that delegates signed the document. 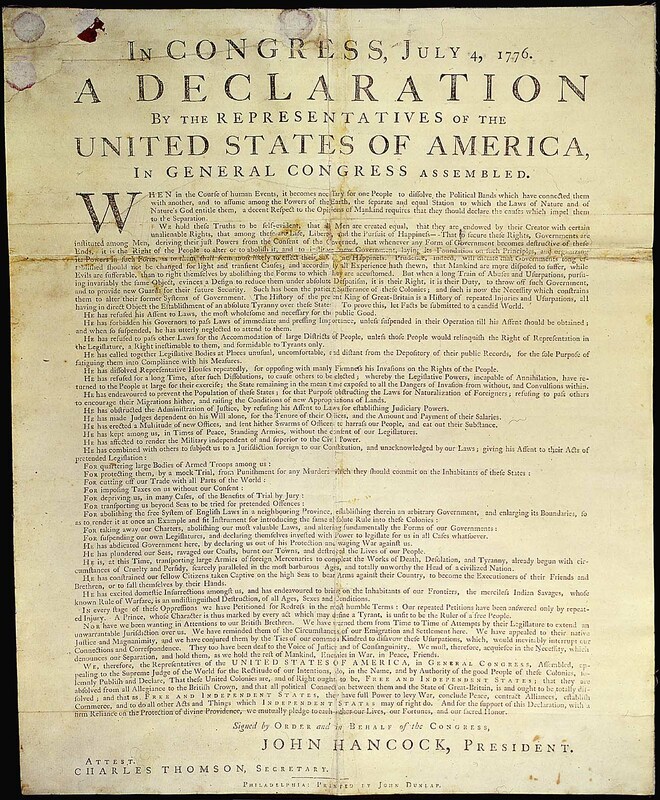 But when it went to the printer, July 4 was affixed in big letters at the top of broadsheets. You probably haven’t memorized the first line. Thomas Jefferson, a Virginian delegate who became the nation’s third president, wrote the declaration as a formal explanation of why the colonies should secede in June 1776. Adams, later the second U.S. president, and Benjamin Franklin edited. The Revolutionary War started before independence was declared. The declaration did not kick off the Revolutionary War. The battles of Lexington and Concord, in April 1775 in Massachusetts, achieved that. (That’s when Paul Revere made his midnight ride.) Though at that point, most colonists still hoped for reconciliation with Britain. The Constitution came a decade years later. We don’t call it Independence Day. Why Americans refer to the holiday as simply the Fourth, rather than Independence Day, is a question for the ages. We don’t wish our neighbors happy October 31 while trick-or-treating, or a happy Jan. 1 while singing Auld Lang Syne. At first, the new country hardly recognized an Independence Day. But after the War of 1812, copies of the Declaration of Independence began circulating again. The deaths of Thomas Jefferson and John Adams on July 4, 1826, may also have helped to promote the idea of July 4 as a date to be celebrated, according to Slate. Independence Day was officially made a national holiday in 1870, as part of a bill that officially recognized several holidays, including Christmas. Some history just can’t be explained.